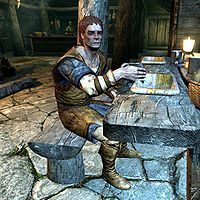 Ranmir is a Nord citizen of Winterhold. He lives with his sister Birna in Birna's Oddments. He spends his days drinking away his sorrows in The Frozen Hearth. You can learn why by speaking to either Haran or Dagur. He's been drunk since the disappearance of his lover, convinced she left him for someone else. He also hasn't been paying for his drinks recently, and Haran could use some help getting Ranmir to catch up on his tab. Ranmir wears a set of farm clothes along with a pair of boots. He carries his house key along with a selection of lower-class items and gold. In combat, he relies on an iron dagger. If the Imperial Legion has taken Winterhold, he may say "Empire's in charge now, huh? Only a matter of time before we start getting bothered by them Thalmoricars... err, Justimors... Y'know, them elves." He disappears from the game after Drowned Sorrows. He can easily be killed by a Magic Anomaly. This page was last modified on 28 December 2015, at 17:03.